We all love to add a dash of saunth ki chutney on our dahi bhalla, papdi chaat, aloo tikki and raj kachori; basically everything chaat. The sweet-tangy chutney adds to the many flavours chaat has. This chutney is made using dried ginger and tamarind paste and is brownish-red in colour. While it is enjoyed in most Indian street foods, it has a bad reputation for making you gain weight. 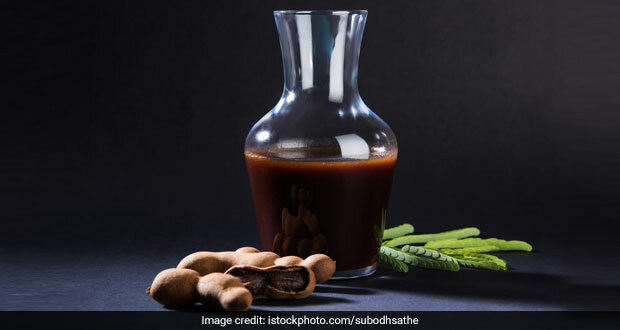 Tamarind or imli, on the contrary, is a great food to help you shed kilos, considering it has one of the most important compounds known as hydroxycitric acid that is connected to weight loss. Moreover, it has fibre present in it that makes it a healthy food. Now, although the dominant part of saunth ki chutney is tamarind, what makes it fattening? Let’s find some answers. Saunth ki chutney is said to be great for digestion; thanks to the dry ginger in it. It is said that digestion is the key to losing weight. Dry ginger has long been used as a natural remedy to reduce the symptoms of conditions like IBS, bloating, gas, constipation and stomach cramps. Tamarind is another great ingredient in the saunth ki chutney that helps you shed those extra pounds. How To Cut Down On Sugar In Saunth Ki Chutney? The best way to make saunth ki chutney more effective and good for weight loss, is by adding the following ingredients in it that make for great sugar alternatives. Jaggery is said to be one of the best and most-unprocessed raw forms of sugar. In fact, jaggery is known to boost metabolism and reduce water retention, which in turn helps in managing your weight. Read: How to tell that the jaggery you are buying is pure. Dates are high in fibre content. Fibre tends to keep you full for longer as it adds bulk to your diet, which further helps you lose weight. Read: Can you eat dates (khajur) in summers? Yes, you heard us! You can add honey to your saunth ki chutney. Honey contains a good amount of fibre, protein and other essential vitamins and minerals that help cut the flab. Read: Why raw honey and not just honey. Basically, anything that’s not refined sugar is good for health. Don’t worry about the taste, as these alternatives will only enhance the flavour of saunth ki chutney. While you cannot ask the chaat-wallah to prepare chutney that has these sugar alternatives, you can definitely prepare it at home; making it healthier and yummier.